We live in an age of ever-increasing secularity, in which religious practice must be half-hidden and religious conviction often-denied. You have to excavate quite deep to discover the moral sources of modern culture: our laws and literature are imbued with the peace and love of Christ, but the common materialist really can’t be bothered with notions of self and identity which lie much beyond the narratives of relativism and concentric circles of hedonistic gratification. Historically, Britain was Christian – in practice, belief, affinity, affiliation, morality and ritual initiation. But now? More people pay touristy visits to chocolate-box churches than worship in them, and our law-making is increasingly antithetical to orthodoxies of salvation. O, you’re free to believe that only Jesus saves and that all others go to hell, but don’t, whatever you do, vocalise it in the street or, worse still, teach it in a school. That’s just extremism, hate, bigotry and a myriad of phobias. Some may recall the diplomatic incident of the Foreign Office papal visit memo, in which some FCO wag suggested that Pope Benedict XVI, during his visit, “could launch a range of branded condoms, visit an abortion clinic, bless a gay marriage and apologise for the Spanish Armada”. Very droll. But it isn’t clear how a faith minister could deter or prevent such expressions of disrespect without offending the freedom of secular-humanists to pour scorn over whatever they want. Is the role simply to enforce common courtesy and propagate an ethos of mutual tolerance? Isn’t that a function of all political leaders? The problem with the notion of a faith minister is that he or she would be charged with defending the role of faith in public life, as opposed to defending the Faith, which, for sure, is primarily the Queen’s job, but so also ought to be binding on Her Majesty’s ministers of state. Yet they have the mutually-exclusive rights of competing religions to defend, and multi-faith votes to win. And the moment your job is to defend faith as opposed to the Faith, you can’t hold any particular belief very strongly at all, for to do so would be to offend someone of faith somewhere. And God forbid that the Minister for Faith might offend anybody of faith. No, they can ‘do God’, and the government can ‘do God’, but only the fluffy, pink bits: all that nasty, judgmental, divisive stuff has to go. Could or would the Faith Minister defend the right of Christians to preach publicly that ‘there is none other name under heaven given among men, whereby we must be saved‘ (Acts 4:12). Men? Good grief, would he or she defend the gender-exclusivity of patriarchy and orthodoxy? Would he or she support the freedom to express the belief that Mohammed was a false prophet or that Allah is not God? What about the freedom to uphold traditional marriage? What about the creed of the Satanists? Or the religious rights of Wiccans, witches and pagans? In an age of pervasive unbelief, would the Faith Minister defend the freedoms of non-faith adherence; the freedom to be simply spiritual; the freedom to believe whatever you want to believe, including Jedi Knights? In which case, would the Faith Minister not actually be the Minister for Fairies, Goblins and Imaginary Friends? If the purpose is to defend faiths – as it must be in an age of ethnic diversity, multi-faith pluralism and moral relativism – then the Faith Minister must be liberal, latitudinal and universalist in his or her own beliefs. After all, you can’t have a faith minister who inwardly discriminates, can you? How could a faith group possibly have confidence that the Faith Minister represents them in Cabinet if he or she really thinks their beliefs are childish nonsense and their leaders are deluded idolaters? Sure, the Minister could be a Muslim, but only one of Baroness Warsi’s liberal strand of ‘British Islam’, which, for many, isn’t particularly Islamic at all. The Faith Minister would have to defend the freedom to to believe in and express any and every christology, even when that belief offends against orthodoxy. 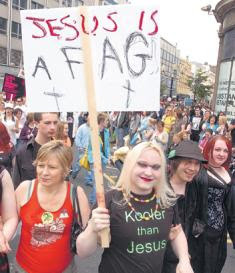 ‘Jesus is a fag’? Well, it’s a view. You’re free to demur, but there’s no law against upsetting orthodox Christians. The blasphemy laws in the UK were designed to protect the name of Christ, though since 1838 restricted to protect the tenets and beliefs of the Church of England. They belonged to an era when the Faith was the nexus of society, and to challenge or offend against that was considered a crime against the established order. Since the laws were not consistently upheld, they became otiose and were repealed. Is the Faith Minister some sort of compensatory guarantor of spiritual protection and residual religious feelings? If this placard had said ‘Ganesh is a gay-boy’ or ‘Buddha is a bugger’, the Hindus and Buddhists might have raised an eyebrow, but, like the Christians, they would have been obliged to endure the offence. But if the placard had dared to say ‘Mohammed is a homo’ or ‘The Prophet is a puff’, Muslims would have been up in arms (some quite literally), and the strange creature carrying the placard would doubtless have been arrested for breach of the peace, or incitement. When we lose the freedom to cause offence, we lose our freedom. In a post-Christian, pluralist, secularised culture, a faith minister would increasingly become a tool of fragmentation and atomisation, seeking to advocate for all and offend none, under the coercive narrative and rhetoric of community cohesion, which then becomes the overriding religious orthodoxy. We don’t need a compartmentalised faith minister to remind ministers about the divine or to guard against offending the Pope: we need all government ministers to ensure that the refrains of religious liberty are woven throughout all policies and programmes of government. It is the Supreme Governor of the Church of England who defends the Faith, and it is under the aegis of that righteous governance that all others must be free to practise their religion or lack thereof. All beliefs are not equal. 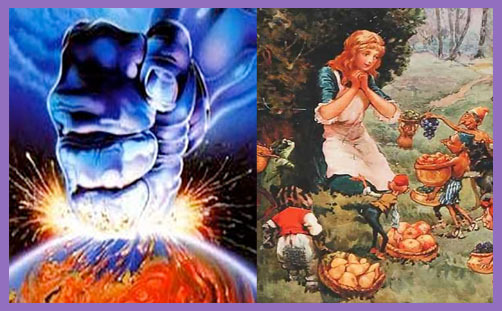 God forbid that the Faith Minister should doubt the existence of or denigrate those who believe in fairies, goblins and imaginary friends.